The first Packard automobile was built in 1899 in Warren, Ohio, at the Packard Electric Company subsidiary plant, the New York and Ohio Company. This successful automobile brought about the formation of the Ohio Automobile Company which evolved into the Packard Motor Car Company in 1902. Production of the Packard automobile ran until 1958. Today, the Packard Automobile Museum is located in Warren, Ohio. Initially, the Packard sons, Willilam David Packard and James Ward Packard, establlished the Packard Electric Company in 1890 in Warren, Ohio. Once the Packard automobile became successful, Warren became the first city in the U.S. to lights its streets with incadescent light in 1911. The framed Packard Motor Car Company stock certificate is dated in the 1940s or 1950s. 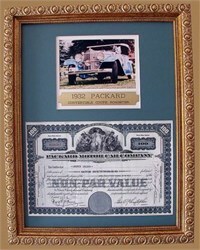 Featured over the stock certificate is a postcard of a classic Packard automobile with an engraved brass plate stating "1932 Packard Convertible Coupe Roadster." The certificate is framed in an antique gold classic frame with 1 1/4" wood moulding. The overall frame size is 14 1/4" x 18 1/4". Archival mounting, acid free backing, double matting, and clear glass are used in preparing the framed certificate. Our sales price includes the historic Packard stock certificate, frame with double matting, labor, packaging and shipping within the continental U.S..